> 1.0IU per dose. The virus is propagated on Vero cells and inactivated with β-propiolactone (BPL) after purification. Aluminium hydroxide gel is added as an adjuvant and thimerosal (0.01%w/v) as a preservative. The vaccine is available in 5ml vial of 5 doses. 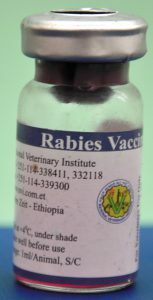 The rabies vaccine should be transported and stored between +2 ºC and +8 ºC. At no storage should the vaccine be allowed to freeze. Protect the vaccine from heat and direct sunlight. The vaccine can be stored for only one year from date of manufacture. * 1ml of vaccine is injected intradermally or subcutaneously. inoculations with month of intervals. areas as per the WHO guideline. agents such corticosteroids or radiotherapy will interfere with the immune response to vaccine.